Do you droll over those store-bought body scrubs that smell so good? What if you could make them at home with natural products? That’s surely a great idea! 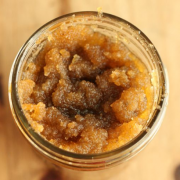 This brown sugar scrub is really nourishing to the skin and is super luxurious. Oh, and the best part? It’s super easy! You can make it in only 2 minutes and all the ingredients are usually available in your kitchen. Mix the cinnamon and brown sugar together in a small bowl. Add all the remaining ingredients and stir everything together with a spoon. Transfer to an airtight container and that’s it! When you’re in the shower, just rub this scrub all over your body and you’ll see that it leaves the skin soft and gets rid of all the dead skin. Plus, you’ll smell super good! Purchase Pine Tree Essential Oils here.